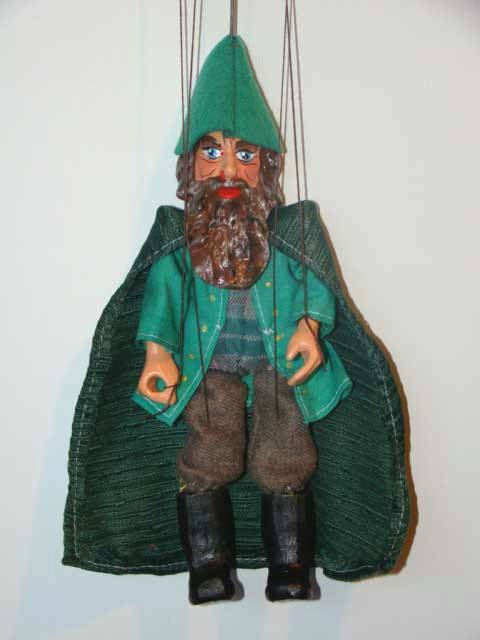 Spirit mountain classical puppet marionette for sale. It is controlled by the Munzberg roller system and a wire with threads. The marionette is made by hand in small batches, using a traditional technique. Its head, arms and legs are molded of modified plaster for sculptures , the body is made from wood. The puppet’s design and clothes are stylized to look like historical marionettes. The marionette is painted by hand using harmless waterproof paints for children’s toys. The puppet can be used as puppet show a educational toys for children aged 3 up or as an unusual Czech souvenir or an original gift.